Iochroma is part of the Solanaceae family. It is a genus of approximately 34 species found in South America. Iochroma flowers attract hummingbirds and are available in red and purple. This plant is not frost hardy and must be brought inside for the winter. Every part of this plant is poisonous, do not ingest. The Iochroma requires a lot of light and prefers warm temperatures. It does well on a well-protected, sunny spot in the garden, balcony or patio. Water the Iochroma on a regular basis. Keep the soil moist and ensure the plant has sufficient draining for excess water. It will need to be fertilized every week. The Iochroma does well in a container or in the garden. Prune the Iochroma at your own discretion. The plant can get very big and stretchy if not pruned. 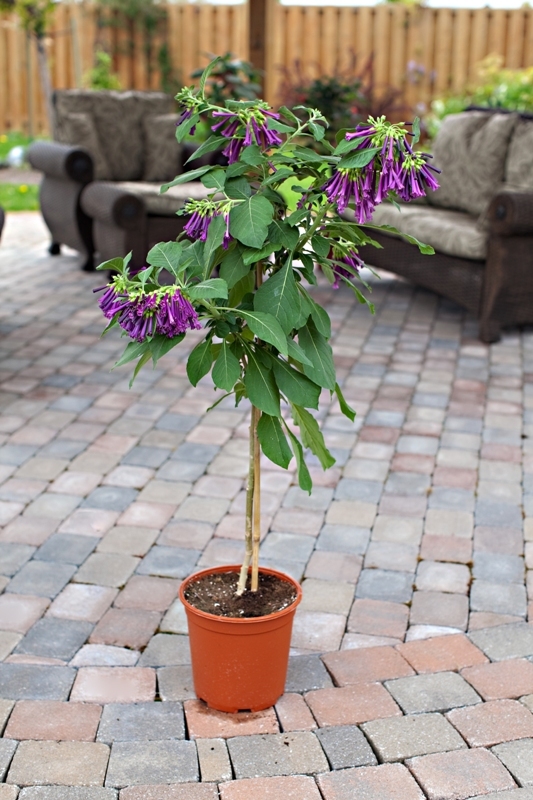 To avoid a stretchy and large Iochroma, cut back new shoots regularly. Although pruning will stimulate new growth, it will keep the Iochroma more compact and help keeps its shape.